The Education workshops in March and October are again dedicated to Outreach. March's workshop focused on turning the piles of quilt tops into sandwiches ready to take home and stitch (what better way to practice your machine quilting). Remember, Outreach workshops are free to everyone, so invite your quilty, crafty, or just darn good pressing friends to learn and pay-it-forward. Itching to do your favorite bit without doing a whole quilt? Check out the Outreach table at every regular meeting for kits at every stage of quiltmaking. 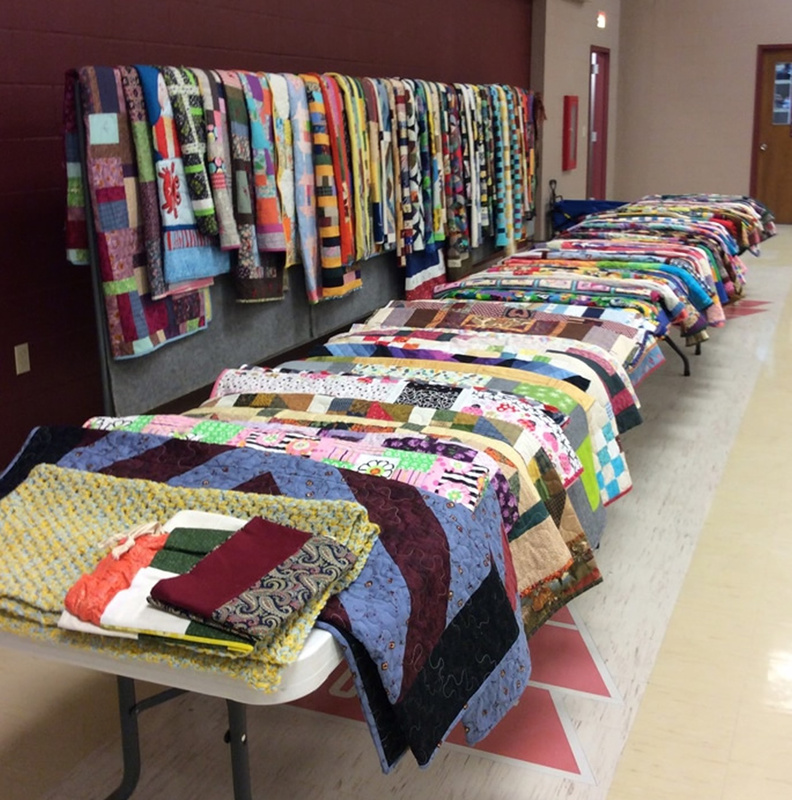 Mark your calendar: Quilts will be donated to NEHSC at our June 2 meeting. What size quilt tops are needed? Rule of thumb: 45 x 60 inches or larger, up to king. However, we are happy to receive any size and appreciate the effort that everyone puts in. Pillowcases are always welcome! We are also looking at ways to process the fabrics we have on hand into kits for our members to assemble. We want to get better about FIFO. Fabric in, Fabric out! We have been overwhelmed with fabric donations as of late. We would like to put a hold on general donations for a while. We only need bright or child friendly fabrics at this time. Please make sure all donations are 100% cotton. We cannot accept bits and pieces unless they are already cut into 5" squares or 2 1/2" strips. We donated 90 quilts to NEHS for foster care children at the December party! Janet Burns was on hand to receive donations. Thank you, our members, for your talents and generosity! And a special thank you to the long-armers and domestic machiners who have committed to quilting whatever sandwiches they are given without remuneration! It's really upped our production. Thank you for your time and thread and equipment and sharing your expertise! 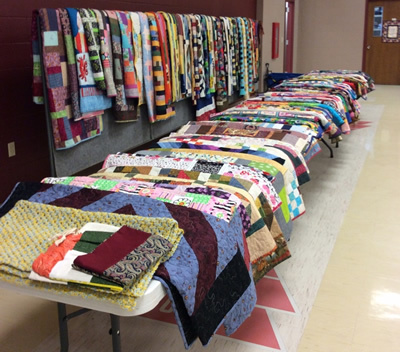 Nearly 100 quilts and other items were donated on June 2. Thank you! What a great outreach day we had after our March guild meeting! Over 25 worker bees showed up to sew jelly roll quilts into blocks for 10 to 15 quilt tops using two patterns! Many blocks went home to be sewn into quilt tops, and several tops have already been turned in! Check the Outreach table at upcoming meetings to pick up a top for quilting or binding. We all had an exciting time opening the 3 boxes of fabric donated for outreach from You Keep Me in Stitches, a quilt shop in Wray, CO. This box also included 3 jelly rolls, which were immediately cut up and made into blocks! We had fun sorting the beautiful cuts of fabrics and panels into coordinating bundles. Many wonderful kits of fabric ready for our members to take home and assemble at the next several guild meetings! We hear that Stashbusters spent a day assembling backings and cutting batting for the tops already donated to Outreach. They will be available for the taking for those willing to quilt the layers together! Thank you to all of our satellite groups for designating one or more of their meetings toward outreach! We donated 172 quilts and more than two dozen smaller items to NEHS for foster care children in 2017! Janet Burns was on hand to receive donations at the December Christmas party. We are so proud of our members talents and generosity! Thank you for all you do for outreach! The guidelines regarding outreach quilt donations were reviewed in August 2017. Read the guidelines published in the September 2016 guild newsletter.